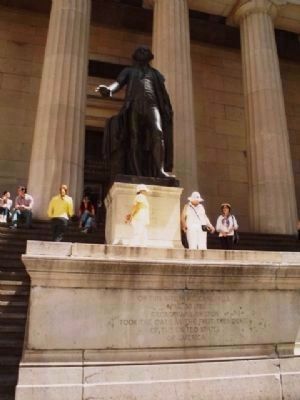 A majestic statue of George Washington stands on the front steps of Federal Hall in memory of Washington’s inauguration as the country’s first president – which happened on this spot on April 30th, 1789. 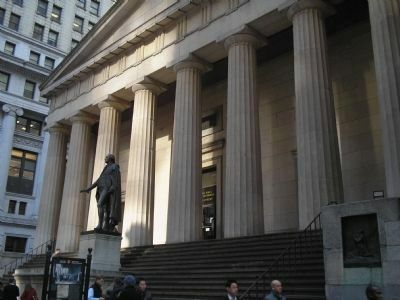 The current building is named for the original Federal Hall, perhaps the most historic site in the entire country, where more than two centuries ago American democracy was born. From 1785 to 1790, New York served as the first capital of the brand-new United States of America. 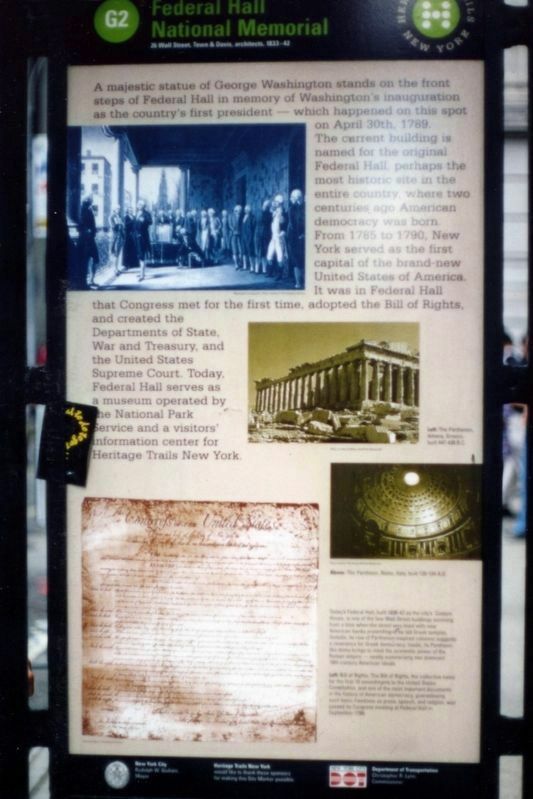 It was in Federal Hall that Congress met for the first time, adopted the Bill of Rights, and created the Departments of State, War and Treasury, and the United States Supreme Court. 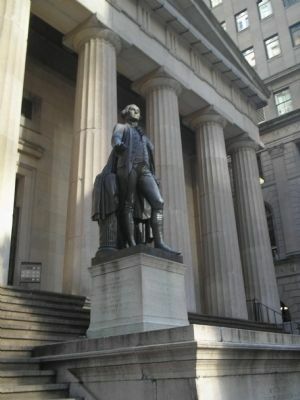 Today, Federal Hall serves as a museum operated by the National Park Service. since been moved across the street, sharing the same standup as the J.P. Morgan Building. 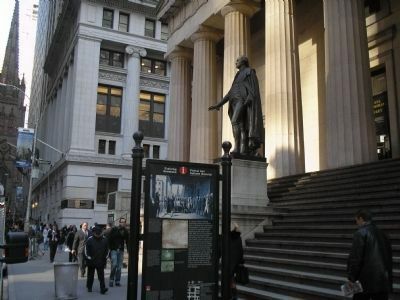 Marker is at or near this postal address: 26 Wall Street, New York NY 10005, United States of America. Touch for directions. Other nearby markers. At least 8 other markers are within walking distance of this marker. 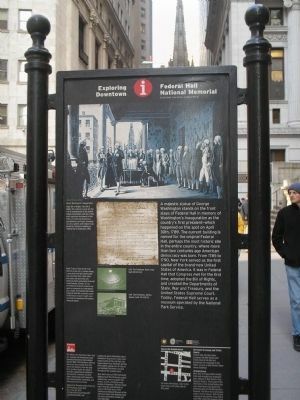 Federal Hall National Monument (here, next to this marker); 40 Wall Street (within shouting distance of this marker); On this site in Federal Hall (within shouting distance of this marker); Wall Street Palisade (within shouting distance of this marker); Ohio Company of Associates (within shouting distance of this marker); City Hall to U.S.Capitol / Money Men / Nassau Changes Scale (was within shouting distance of this marker but has been reported permanently removed. ); J.P. Morgan Building (within shouting distance of this marker); J. P. Morgan (within shouting distance of this marker). Touch for a list and map of all markers in New York. 2. 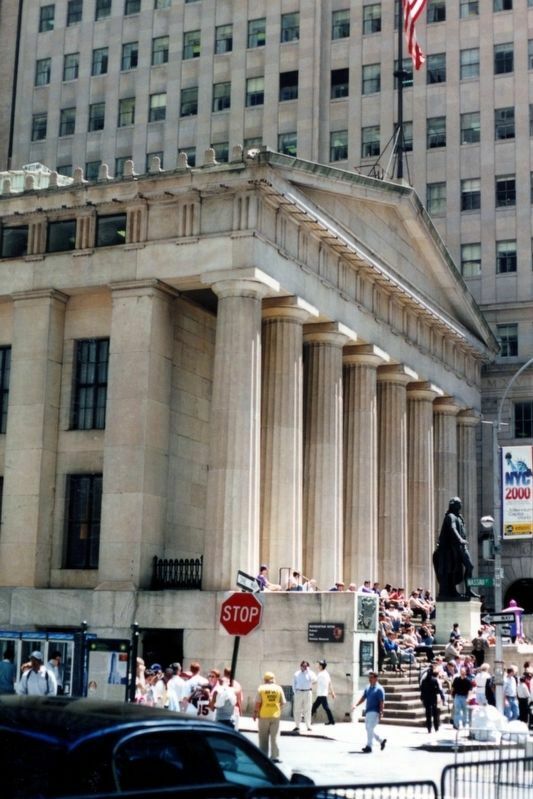 Federal Hall. Earliest Continental Congress; Washington Inauguration; Home of the Bill of Rights. 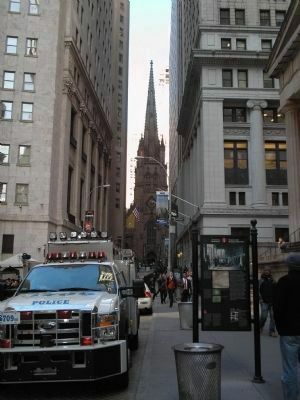 Historic Trinity Church can be seen beyond the marker, at the end of Wall Street. 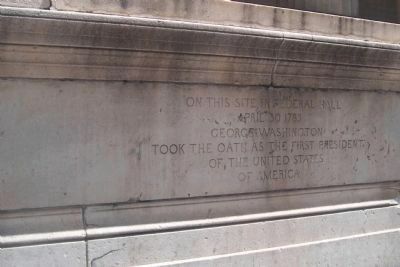 The statue of George Washington and Greek columns of Federal Hall are seen here behind the marker. 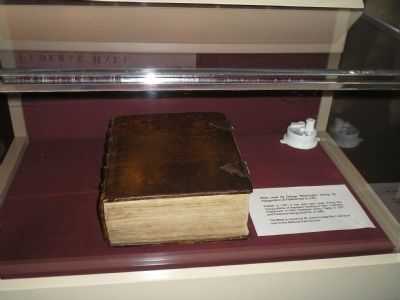 Bible used by George Washington during his Inauguration at Federal Hall in 1789. Printed in 1767, it has also been used during the Inaugurations of President Harding in 1921, President Eisenhower in 1953, President Jimmy Carter in 1977, and President George Bush Sr. [sic] in 1989. The Bible is owned by St. John's Lodge No. 1 and is on loan to the National Park Service. 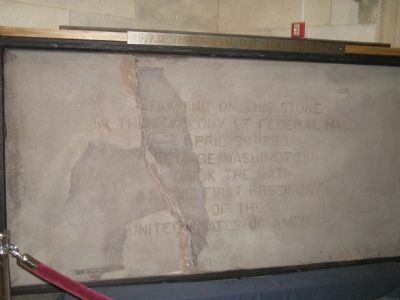 It can be seen inside Federal Hall. Complete view of the Wall Street façade. More. 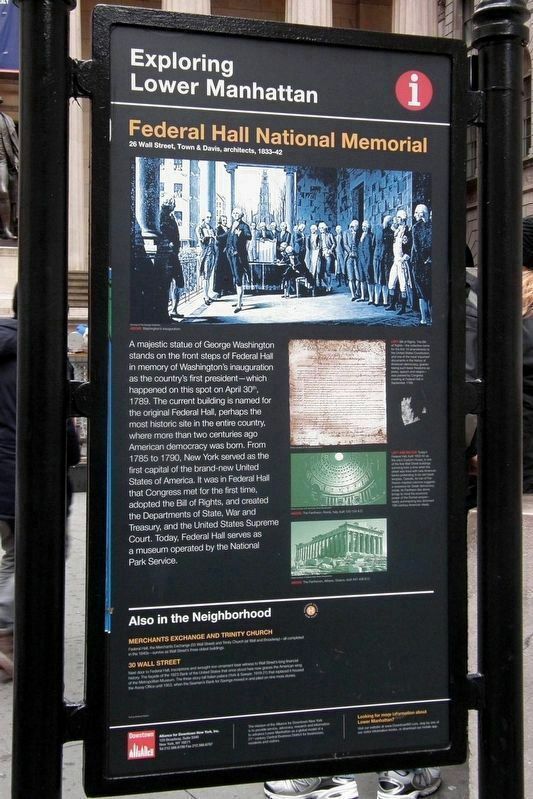 Search the internet for Federal Hall National Memorial. Credits. This page was last revised on December 27, 2018. This page originally submitted on November 8, 2009, by Bill Coughlin of North Arlington, New Jersey. This page has been viewed 1,379 times since then and 9 times this year. Last updated on December 27, 2018, by Larry Gertner of New York, New York. Photos: 1. submitted on December 22, 2018, by Larry Gertner of New York, New York. 2, 3, 4. submitted on November 8, 2009, by Bill Coughlin of North Arlington, New Jersey. 5. submitted on April 30, 2011, by Volker Schmidt of Albstadt, Germany. 6, 7, 8, 9. submitted on November 8, 2009, by Bill Coughlin of North Arlington, New Jersey. 10. submitted on April 30, 2011, by Volker Schmidt of Albstadt, Germany. 11, 12. submitted on December 22, 2018, by Larry Gertner of New York, New York. • Bill Pfingsten was the editor who published this page.